....Later the Star Theatre was erected, then came the Paramount Theatre (an old winery building from near Dookie) erected by a local company. The climax came when Mr, W. N. McMillan, J.P., bought out the Star Theatre, the Paramount Theatre and a block of land in Maude Street on which he erected the Lyric Theatre about eight years ago. The architect for the building was named Philp, and the builder J . C. Willoughby . 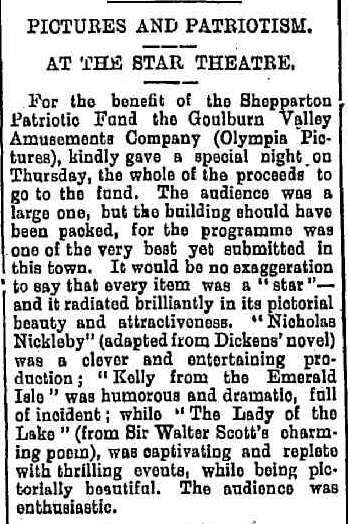 Mr. McMillan also spent thousands of pounds in improving the Star Theatre since he acquired that property. The moving picture form of entertainment was prior to 1911 supplied by touring companies, but local enterprise moved in the matter, and a company was formed to supply local entertainment bi-weekly. They opened an open - air theatre between the Mechanics Institute and the Savings Bank buildings , and met with success. Another company was formed in opposition, and started on a block of land where the Union Bank premises today stand. The first company closed down, and another picture theatre opened on the present Paramount site. They purchased the old winery building from near Dookie and removed it to Shepparton , where they erected facilities to have either indoor or outdoor pictures , having the operating box in position to serve both purposes. 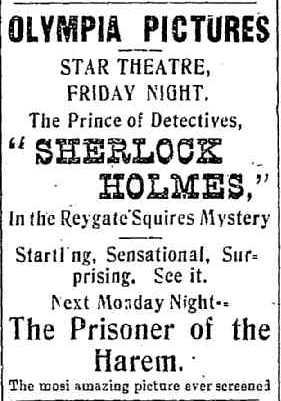 The Star Theatre proprietor soon got busy and also entered on this form of entertainment. Eventually the open-air theatre at the corner of Wyndham and High Streets closed, leaving the Paramount and Star Theatres the sole buildings for such entertainment. Mr. McMillan, by buying both properties , has been the means of improving the programmes. His enterprise in building the Lyric Theatre marked a progressive step in picture entertainment, for a couple of years ago he installed the first talkie apparatus in the Lyric, and more recently still, another machine in the Star Theatre, since which time picture and talkie entertainment has been regular each night of the week. 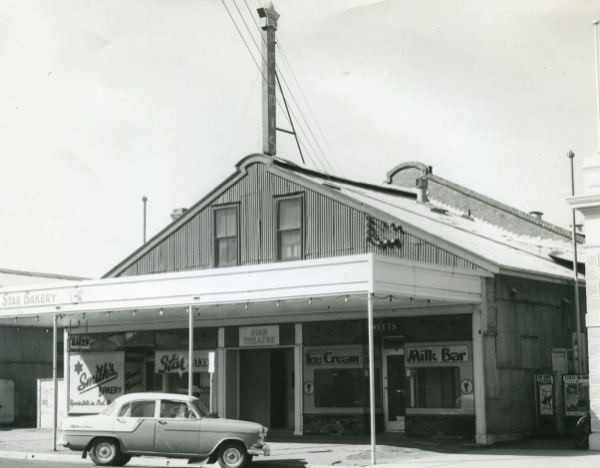 A dance palais was established by J. Sutherland a few years ago at the corner of Nixon and Wyndham Streets, and was conducted in the open air. The first Mayoral ball took place in July, 1928, the Mayor being Cr . A. W. Fairley. His sister -in-law, Mrs. J. F. Fairley was the Mayoress . There were 25 debutantes present on the occasion . It was held in the Star Theatre ballroom . In July, 1929 , Cr. Fairley, now Mayor for the second time, gave another Mayoral ball in the same building . Mrs. J . F. Fairley was again Mayoress for the occasion , when there were 21 debutantes present. At both these functions there were about 1000 guests on each occasion . The decorations were the most elaborate ever seen in Shepparton , and cost hundreds of pounds. Supper was provided on both occasions in the mart buildings adjoining. On the afternoon of September 11, 1933 , the first Mayoral reception to citizens was held in the Star Theatre, when '&00 were present. 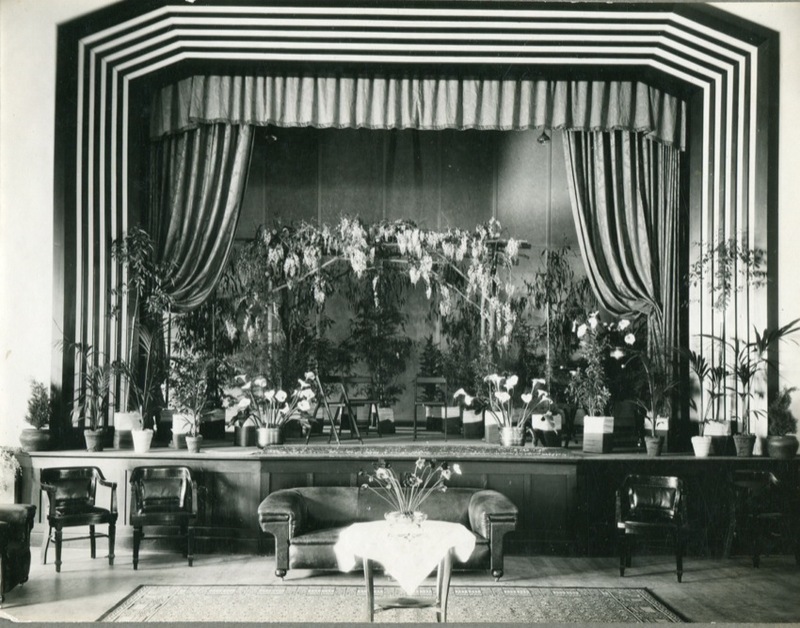 The theatre was decorated for the occasion in a floral manner. The supervision of the decorations was in the hands of Mr. West, the Town Clerk, assisted by the borough head gardener (Mr. Williamson ) and consummate taste was used, the main feature being lawns and gardens with a fish pond, which was in the centre of the floor of the ballroom, whilst the proscenium was decorated with pergolas entwined with flowering creepers and young trees and plants. The guests were received by the Mayor and Mayoress, Cr. and Mrs. W. S. James, at the main entrance. Musical items were given during the afternoon, whilst the guests were served afternoon -tea-in the supper room.